Greece boasts the longest coastline in Europe (Greece 13.650km, United Kingdom 12.430km, Italy 7.600km, France 3.427km) and 5 distinct sailing areas. The Greek islands were my childhood’s playground. At first sailing with my parents and, as a teenager, on my own. I then went on to roam the oceans and visit faraway, exotic places, but always came back to my “private garden” from which I will now share some insider know-how with you. Acceleration funnel between the Balkanic and Turkish landmasses, it features in summer a steep pressure gradient between the western Mediterranean high and the heat low over Asia, generating a strong northerly air flow known as Meltemi (Etesian or yearly wind). In winter southerlies prevail but gales may blow from any quadrant. Local specifics: without the soothing Meltemi (which rarely exceeds 35 knots) heat would rapidly become scorching. What one must bear in mind is that moderate winds may last for a week followed by calms. Strongest Meltemi seldom howls for more than a day or two, allowing an experienced skipper to anticipate the blow (by monitoring the persistance of the western Mediterranean High pressure) and shape accordingly his itinerary. The brief fetch between the islands is responsible for very steep, choppy sea conditions which dramatically reduce most boats’ability to sustain a close hauled course. Using skiing terminology, the Cyclades are the “black slope” of Greece’s sailing resorts. Best avoid: a green horn would typically plan an over ambitious route and overlook the hefty acceleration zones. With Meltemi conditions, stay away from lee shores, particularly the south coasts of Tinos, Andros and the east coast of Amorgos. The island group being arranged in a circle (hence it’s name) and winds having a NE slant in the West and a NW slant in the East, it is feasible to island hop, circumnavigating clockwise without having to tack! Globally, the best seasons are late spring (the time of flowers) and automn, when the weather is at its mildest, with more fluctuating winds, authentic island life and less crowds. This is postcard Greece at its best: cloudless skies, crystal clear waters, small barren islands dotted with tufts of dry herbs, immaculate white hamlets perched on hill sides, wind and more wind! Delos’ archeological site, Ermoupolis’ neoclassical town, Sifnos’ and Amorgos’ hills and villages, Santorini’s caldera, Sikinos and Folegandros. Cherry tomatoes, capers, white eggplants and split peas (fava) from Santorini, hard cheeses (graviera) from Naxos, powerful soft cheeses (kopanisti) and air-cured pork filet (lounza) from Syros, Tinos and Mykonos, goat cheese aged in wine (manoura) and almond pastries from Sifnos, Turkish delights and nougats from Syros. Santorini wines are now world famous, visit the wineries and sample wines made from ancient indigenous cultivars such as Asyrtiko, Aidani, Athiri (whites), Mandilaria and Mavrotragano (reds). Equally excellent are Paros’ reds made from Mandilaria, Monemvasia (the famous Malmsey) and Aidani. While in Paros, sample the local (grappa) Souma and in Naxos the Kitron (citron) liqueur. On either side of the Cyclades but less under the influence of the summer winds lie the Argo-Saronic Gulf and the Dodekanese islands. Twelve island chain along the turkish coast, Greece’s southeasternmost archipelago has long shone with its cultural wealth and proximity to Asia Minors natural ressources. Apart from their own appeals, the largest islands boast international airports bringing closer the Turkish coast with its sheltered waters and numerous marinas. However, because of Schengen agreements, plying back and forth between Greece and Turkey is not convenient due to red tape. 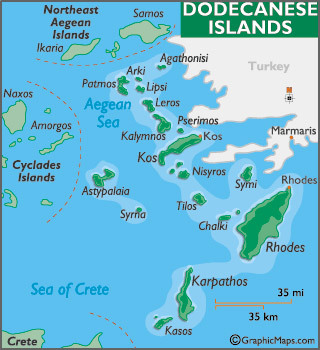 In practice, when you charter a boat in Greece you have to stay in the Greek islands and when you charter out of a turkish base you are restricted to the coast. Minor local amendments have been made to this rule, in Symi, Kastellorizon and Datca where one may spend up to 2 nights in”transit”. Summer meltemi blows mainly from the Northwest, backing to the West in the afternoon and veering to the Northeast at night. Thermal influence and variation is at it strongest close to the asian continent. The summer wind is at its strongest near the western tips of the large islands and funnelling with great ardour in the straights between Rhodos & Karpathos as well Samos & Ikaria. In spring and fall a low pressure system approaching the Balkan peninsula may generate hefty South-easterlies blowing through the channels between the island chain and the continent. While cruising in summer, the greatest hurdle consists at beating from Rhodes to Kos, the stretch being directly up wind. The riddle is solved by making best use of the thermal variation by sailing in a westerly direction at night and during the morning (when the wind is from a NNE direction) while from midday till the evening favor a northeasterly course (when the wind has a WNW slant). It is thus feasible to sail northwards, but not necessarily easy, as local geography complicates the task by generating further wind variations. A similar strategy may be applied when trying to sail across the Aegean, through the Cyclades: sail northwards in the afternoon till reaching Patmos. Then, once the night has fallen, the wind abated and veered to the NNE, shape a Westerly course. Thus, one may easily reach Mykonos by sun rise. 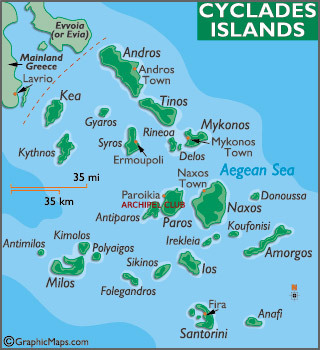 On the other hand if sailing only in daylight, departing from Patmos, one would only fetch Amorgos, as Asia minor’s thermal influence corrupts the Meltemi till Naxos’ East coast. 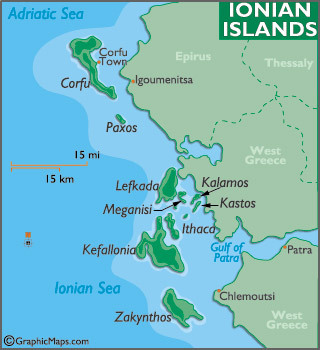 Among the most interesting islands are the least known and the smallest : Kastelorizon (Megisti), Halki, Symi, Nisyros, Arki and Gaidaros (Agathonisi). Surrounded by turquoise waters, these islands are generally dry and rocky, dotted with olive trees with the occasional goat herds munching on dry bushes. The architecture consists of a happy mix from cycladic and Neoclassical styles with the odd italian Art Deco public building thrown in. The largest islands offer a good level of services with chandleries, marinas and airports. Near fertile coastal plains, Rhodos’ medieval town, magnificent Lindos, the cycladic Hora topped by its monastic fortress of Patmos nor theold town harbour of Pythagorion should not be missed. Wines of Rhodos (from Athiri, Mandilaria & Moschato Aspro cultivars - CAIR & Emery cellars are worth a visit) and the extraordinary sweet Muscat Blanc (Moschato Aspro, VLDQS. Cellars of the local coop winery ) of Samos, aged in oak casks and worth a good Sauternes. Sample in late spring, when milk is at its tastiest, the goat cheese pastries (sweet or salty poungia). In Rhodos try fresh home made pasta (Hylopites) and onion fritters (Pitaroudia). Backed by the spectacular mountain ranges of Eubea and Pelion (Centaurs’ mythical homeland) the Sporades island group belongs to the top tourist destinatons in Greece, boasting moderate winds, mild temperatures, lovely villages and pine groves reaching the beachfront. The quasi unhinhabited island of Kyra Panaghia aswell as some adjacent islets constitute a unique natural park for the endangered mediterranean monk seal (Monachus Monachus). A moderate northerly (Meltemi “light”) is predominant in summer, freshening near Skyros. Thunderstorms or downpours are not uncommon on calm days. Among Greece’s top ten island destinations Skopelos should not be missed! 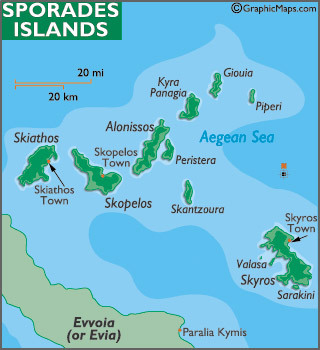 Visit the Choras (island capitals) of Skopelos and Skyros. Moor in wonderful, sheltered coves such as Panormos, Elios (Klima), Agios Petros and Planitis (at Kyra Panaghia). Architecture carries influence from nearby Pelion, where one may find some respite when tourist hordes swamp Skiathos. 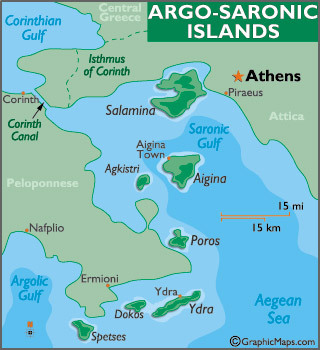 Aka the Gulf of Athens, used to be a cruising gem, until the eighties when it became a wider superb of sprawling Athens. Moderate winds, short sailing distances between lovely anchorages and fishing ports, the purple backdrop of the Peloponese mountains, it was like a dream come true. With progress of motorways, fast ferries and hydrofoils, all the delightful locations became quickly accessible and subject to a real estate boom. Spilling every weekend from Athens’ 9–odd marinas, hundreds of pleasure craft are saturating all the small ports. Of course world heritage sites like Hydra, Spetsai. Navplion and Monemvassia (Malmsey of lore) were preserved thanks to stringent building regulations and remain heavenly destinations of a tranquil cruise. Being close to Athens has also its advantages, good infrastucture, access to parts and services. Cruisers will appreciate well sheltered and free anchorages at Poros and Porto Heli. Meltemi is mainly beeen felt during summer at the eastern approaches, along the Sounion-Hydra-Monemvassia axis. Further West thermal influx takes over with its switch fom E-ESE during daytime to WNW at night time. The arrival of high pressure ridge with strong northwesterlies in the Ionian may generate gale force westerlies around the eastern Peloponese, tumbling down the steep mountains at night. These occasional blows affect an area reaching the western Kyklades. Coastal sailing along the Eastern Peloponese with its steep mountains embracing fertile, well watered valleys. Islands are mostly dry but boast wonderfully set villages. Enjoy wonderful sunsets revealing mountain chains bathing in purple light. Epidaurus classical theater, privateer’s harbour towns of Hydra, Spetsai and Poros, lovely neoclassical city of Navplion with nearby bronze age Tyrins & Mykinai, the walled medieval city of Monemvassia. Finest olive oil (very neutral in taste) fom Kranidi, citrus fruit from Navplion and Troizoen (Galatas), superb VQPRD dry reds (Agiorgitiko) from Nemea and dry but fruity whites (Moschofilero, an indigenous Blanc de Gris) from Mantineia. Finally you may occasionally encounter the real Retsina, a primitive wine, from Savatiano cultivars and only –please- drawn from wooden barrels! Among the specialty dishes of the area do not miss “Spetsiota” (baked grouper with herbs and wine), stewed aubergines, baked artichokes (anginares) or “kokoras me hylopites” (rooster and red wine stew, served with home made pasta). The seven island group in western Greece, from Othonoi (north of Corfu) to Strofades in the South and all the seaboard from the Albanian border to the Messinian Gulf in the Peloponese. During the summer, the predominant feature is the High Pressure of the western Mediterranean with its consequence of light, warm and humid thermal breezes. Local specifics: low pressure areas in the gulf of Genoa and weakening of the western High lower atmospheric pressure over the adjacent Epirus mountain range generating hefty thunderstorms. When the low has moved out, a strong to gale force northerly (the Bora) blows for a day or two. It’s Greece’s sailors’ sandbox, which explains the large numbers of power boats and the important charter fleets, particularly flotilla operators (midsize sail boats sailing in packs under the leadership of a “tour captain” and litterally swamping small harbors and coves. One meets lots of British (and Italian in August) tourists. Olive and citrus groves strewn with tufts of cypresses, pine woods reaching the coast, pastel coloured villages with tiled roofs. Venice’s mark is still present in Corfu’s old town and fortresses. The british occupied the islands for a while in the XIXth century, leaving a legacy of cricket games in Corfu every weekend! 1953 horrendous eathquake devastated Cephalonia, forcing most of the population into exile and destroying all buildings except in scenic Fiskardo on the northwest shores. Must see: Corfu old town, Fiskardo cove, Mirtos beach, the numerous inlets and coves around Lefkas, Delphoi on the Corinth Gulf and keep a sharp look out for the endangered loggerhead turtles nesting at Kaminia beach on Cephalonia. Olive oil, wines (in particular VDQS Nemea Aghiorgitiko reds and VLDQS sweet red Mavrodafni from Patras, Robola whites), dried Lefkas salami and Corfu air cured pork filet (Numbulo), Mesolonghi mullet roe (avgotaraho) and Epirus soft cheeses. Local specialties: in Corfu veal Sofrito and cod Burdetto, in Cephalonia (kreatopita) oignon & mince pie, in Zakynthos (Stifado) rabbit stew. After dinner, sample Epirus (tsipouro) grappa or kumquat liqueur from Corfu.